The Centre for Pakistan and Gulf Studies (CPGS) launched its mega project SALAM: Innovating Means to Resolve Extremism in Pakistan in August 2013. The Project was aimed at identifying means to eradicate the menace of extremism from Pakistan. Under this project, the Centre has launched a sub-project, “Countering Violent Extremism: Global Action Plan”. Violent extremism has become a monumental challenge in today’s time and age. The ideology behind violent extremism cannot be defeated in a battlefield; only a well-informed counter-ideology aimed at identifying and eradicating the problem from within communities can help cope with this menace as the threat spectrum of violent extremism is intensified by the fact that it is not linked to a specific religion, civilization, nation or ideology. From one corner of the world to another, violent extremism equally affects all, irrespective of creed, culture and cast. To deal with this menace states today have acknowledged the need to develop an effective strategy to counter violent extremism. Keeping in view the above, CPGS is envisioning to broaden the scope of the debate on eliminating extremism from the national to international platforms. Should the CPGS editorial board approve the abstract, you will be contacted within 10 working days and requested to submit the complete work. A token honorarium will also be paid to all approved authors. Please read the instructions carefully prior to submission. In case specified guidelines are not met, a request for re-submission will be made. Authors should submit their manuscripts via email and post. All identification information must be provided for each author. Please proofread your paper carefully before submission (or use a copy editor if necessary). Text must be double spaced (including interviews). Times New Roman 12 font must be used. Nothing is underlined. Numbering begins on the title page (page 1), and is in the upper right corner. The paper must be left justified. There must be one-inch margins on all sides. Please use letter format (not A4 or international). Please be sure that all electronic comments (track changes) and corrections between authors have been removed (not just turned off). There should be no footnotes in your manuscript. All references shall be provided in endnotes. Implications and Conclusions. Use keywords within your abstract (very important for indexing and abstracting). Do not include any citations, tables, figures, or any information in your abstract that is not in your manuscript. Please note that the manuscript file must be complete (title page, author information, abstract, main text, appendix, references, tables, figures–in this order) as one file only. Please use black and white for figures and photos to reduce the file size. When you resubmit your paper, please include a set of overview revision notes describing how you addressed the broad issues and reviewer concerns identified during review. Please keep your notes as brief as possible, with no repetition. Please be sure to follow the editor’s instructions from the decision letter. Please return your revision in a timely manner. Every submission must have a contribution statement (for the review process only). This statement should be placed after the author note and before the abstract. As submissions to Foresight are evaluated as advancements to a body of knowledge, we require all authors to provide citations or titles for all of their related papers published, in press, or under review at other journals. Please list these citations and titles in your notes to the editors. In addition, final acceptance of manuscripts is conditioned on a check using anti-plagiarism software. Please refer to http://publicationethics.org for a collection of definitions and general information concerning plagiarism. When submitting new manuscripts for review, authors must include a paragraph in the note to the editor section with the following information for each study: where and when the data was collected, and who collected the data. This paragraph must be included as part of all manuscripts accepted for publication. Today, Pakistan is passing through the most critical phase of its history in which it is facing, together with a feeble democracy and fragile economy, the mounting pressure of terrorism and a hostile eastern neighborhood. The entire security apparatus of the state is busy in operations in different areas of the country, while our political elite finds it hard to show national unity at this critical juncture. The internal and external security as well as economic and political challenges of the country require all encompassing concerted efforts and national cohesion. However, it is important to note that in the aftermath of the Peshawar school attack, the government came out with a policy, termed as the National Action Plan (NAP) to uproot terrorism. The NAP is endorsed and supported by all the political parties of the country; as there is a strong realization in society and the decision-making elite that the survival of state lies in eliminating all forms of terrorism. 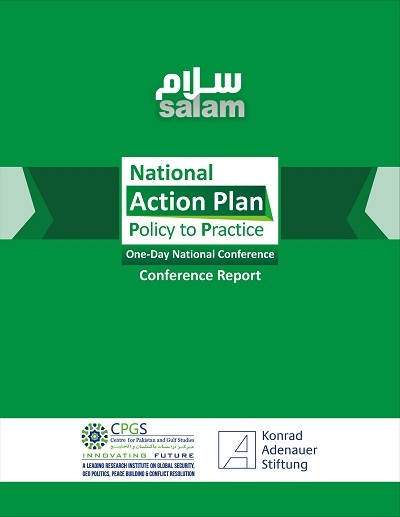 In order to highlight the significance of the NAP in the current security paradigm at the national, regional and global level, the Centre for Pakistan and Gulf Studies (CPGS), in collaboration with Konrad-Adenauer-Stiftung (KAS), has organized this conference titled, “ The National Action Plan (NAP): Policy to Practice”. This conference is an attempt to bring to limelight the challenges that the government would face in the implementation of NAP and shed light on the significance of various aspects of security-related issues with legal, political, security and economic dimensions. The Centre for Pakistan and Gulf Studies (CPGS) is a non-partisan research institute established with a vision to innovate future prospects for peace and security in the region and beyond through undertaking research on global security, geo-politics, peace-building and conflict resolution. 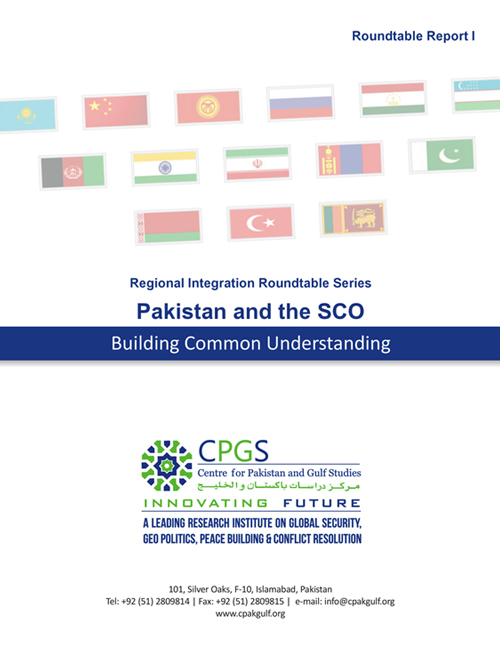 To this end, CPGS, in collaboration with Konrad Adenauer Stiftung (KAS), organized a roundtable discussion titled, ‘Pakistan and SCO: Building Common Understanding’, at the CPGS office. The roundtable was organized as part of the Centre’s ongoing project on ‘Regional Integration: Road to Peace and Prosperity’, which aims at promoting a common understanding on issues of mutual interest and explore avenues of cooperation, amongst the states of South and Central Asia. The roundtable intended to enhance understanding about the significance of Shanghai Cooperation Organization (SCO) in promoting regional connectivity and building understanding of the benefits for prospective members like Pakistan, and the impact of their membership on the organization as a whole. Two esteemed experts – Ambassador (R) Akram Zaki, Former Secretary General for Foreign Affairs, Pakistan and Dr Mavra Innayt, Assistant Professor, School of Politics and International Relations (SPIR), Quaid-e-Azam University (QAU) – discussed at length the various aspects of the prospective membership of Pakistan in the SCO. The discussion was chaired by General (R) S. M. Owais HI(M). The roundtable delved into the history of the SCO, its core objectives, relevance in the world order as well as prospects for Pakistan’s membership of the SCO and possible avenues of cooperation. The SCO is increasingly becoming significant both in regional and international affairs, due primarily to the following two reasons. First, the SCO states have vast natural energy reserves; second, they are a huge market for foreign exports and the third is their increased geopolitical significance in the Global War on Terror (GWoT). While initially the SCO focused more on internal security aspects – like the separatist and Islamist movements inside the member countries, currently its interests have expanded and are predominantly shaped by economic interests, regional connectivity and energy trade. The SCO’s security and economic interests are now expanding to the South Asian region. Nonetheless, the collective desire to tackle non-traditional security challenges remains at the heart of the SCO coordination. During the last summit, for example, SCO countries focused on the situation in Afghanistan and matters relating to the extension of membership to Pakistan, India, Afghanistan and Iran, in addition to the usual agenda items of regional stability and economic development issues. This trajectory of the SCO agenda also highlights the intention of the current SCO states to develop a regional trade hub that includes Pakistan and its three neighbors; India, Afghanistan and Iran.